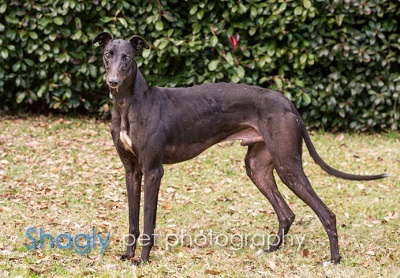 Moonie is a 4-year-old black male born August 27, 2012. His sire is Lamorge Aces Up and his dam is KB's Insta Flex. Moonie was not individually registered and never raced. He was found as a stray in Tulia, TX. Moonie is heartworm negative, but is heavily infested with intestinal parasites, as well as he has a significant positive titer to Ehrlichia Canis. Treatment for both has started and will continue for the next 7-8 weeks. Moonie is not considered cat tolerant at this time. Moonie for some time has been treated with a medication for skin itching. It has not improved so he is headed to see Dr. Dennis Crow, of Animal Dermatology Clinic on May 3. Moonie completed successful treatment for his Ehrlichia Canis and has a negative PCR (polymerase chain reaction) test. Dr. Dennis Crow administered a complete allergy test to Moonie, which showed positive to some environmental grasses, trees and fleas, but not mold. He is on daily oral administration which has helped his skin itching drastically. His final medical procedures have been completed. "Look into my eyes and you can see the depth of the love I have for you," says Moonie. 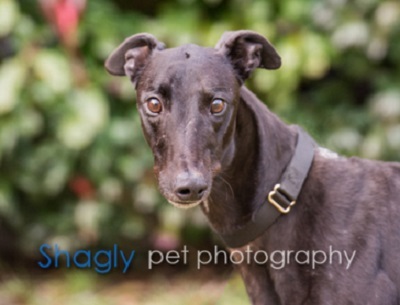 If his shiny black coat doesn’t grab your attention, his dark, soulful eyes just might do the trick. 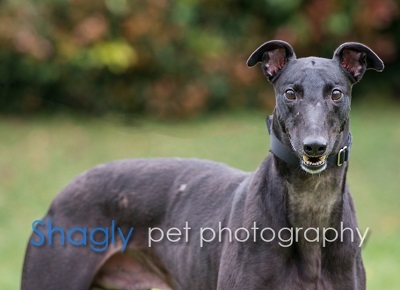 Moonie is a big, happy, full-of-love, incredibly handsome and totally devoted boy who will always be by your side. Moonie adores the toy box and somehow manages to find the one toy that still has a little squeak left in it. He grabs it with his mouth, rears up and throwing his front feet in the air with the toy in his mouth several times just to make you laugh. Moonie enjoys his walks and he relishes getting plenty of attention from everyone he encounters. He’ll especially appreciate it if your yard or walk provides plenty of squirrels for his hunting entertainment (he hasn’t actually caught any, but he remembers where he’s seen every squirrel, ever, in any tree). Having a wading pool to lounge in on a hot summer’s day will thrill him. Because of his high prey drive, Moonie cannot live with very small dogs or cats. This boy lives to eat and he’ll gladly share your fruits and vegetables. Moonie has a few allergies so he gets two drops AM/PM and those are helping to control his itchiness. Moonie is well-behaved and he rides well in the car, so you’ll both enjoy your outings. 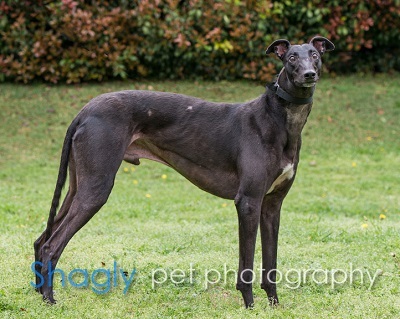 An easy going greyhound, the Moon-man gets along well with other medium to large sized dogs. As a classic “Velcro dog”, Moonie will appreciate being able to be close to you, wherever you are.